Canadian Maple Leaf Christmas Tree Ornaments for Sale! Presenting a Canadian maple leaf Christmas tree ornament with authentic Swarovski rhinestones. Choose from 14 assorted solid colors when you add the item to your cart. 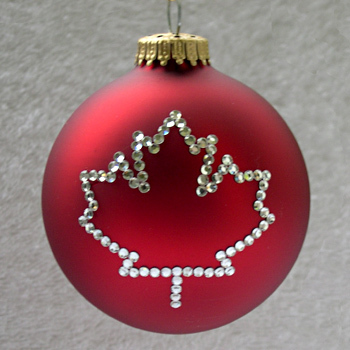 Canadian maple leaf Christmas tree ornaments with authentic Swarovski rhinestones can be purchased at Designer Ornaments. Canadian maple leaf Christmas tree ornaments depicting a Canada maple leaf can be purchased at Designer Ornaments.